Bing VS. Google – A Spark of Search Engine Wars? 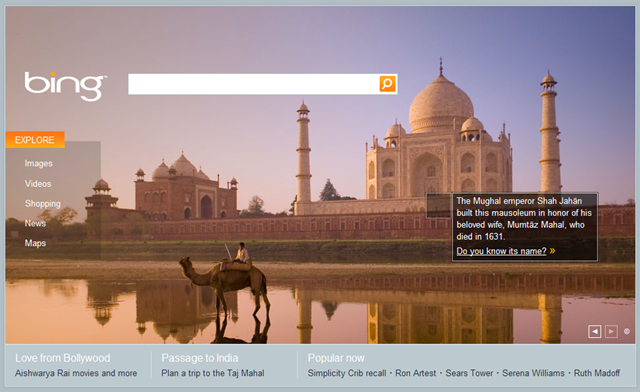 Bing is a new search engine from Microsoft that has been released exactly one month ago. During this month it has created a lot of buzz. Bing is advertised by Microsoft to be a “Decision Engine” and it seems like there is a general feel, or at least enquiry, about bing constituting serious competition to Google search. After reading Scott Hanselman’s recent blog post comparing Lenovo’s ThinkPad W700 with the W500, I decided to give bing a little try. I decided to use google-vs-bing.com to compare the results. This website gives you the search results from Google search and bing side by side in two frames. I searched for “Lenovo w500” and I was impressed by the level of interactivity and instant access to the information, I really wanted, about the product from bing. Conveniently, links to other relevant searches like Specs, Manual, Battery and Reviews appeared to the left of the search results. Note also that product details, along with expert reviews and user reviews when available, are one click away from here. This level of instant availability of relevant information makes Google search results look outdated. However there are two things that I liked more in Google’s search results. 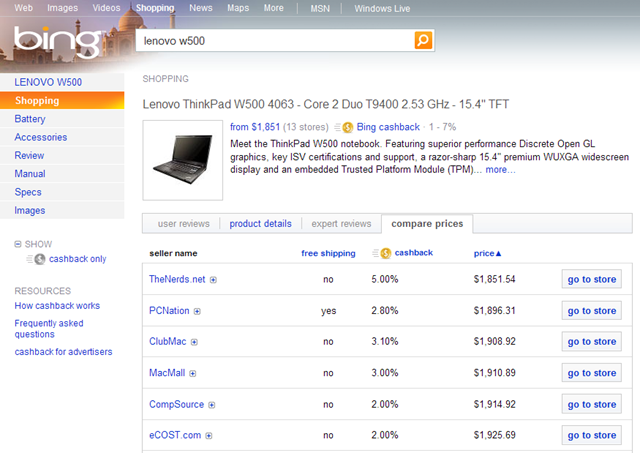 The first search result was the ThinkPad W-Series page in Lenovo’s website and the nested result underneath that was the ThinkPad W500 page. The second is that Google search results included videos of product reviews from YouTube. Something that bing didn’t do. Doing some searches using both Bing and Google, I found that on certain searches Google produces better results but the overall user experience is certainly better in bing, specially for searches that involve making a decision like reviewing products. For many years Microsoft has been trying to have a significant place in the search engine market without much success. I have never considered having MSN search or Live.com as my default search engine in Firefox. In many ways they were inferior to Google search. But now I have bing as the default search engine in Firefox and I will keep it like that for a while to test it thoroughly. I think there is an important lesson here. Search engine users, including me, have for many years appreciated the clean and straightforward presentation of search results that Google pioneered. However, thinking that imitating this can be enough to compete with Google search is a huge mistake and we saw it fail time and time again. Building on the lessons learned from the success of a certain product is good but it is not enough, you must take it beyond that with your own innovation. I think Microsoft succeeded in doing that with bing. The success of Google certainly goes beyond establishing a successful brand name. However, a clever brand name helps a lot in constituting identity, attracting users and making the product part of our daily lives. I think Microsoft’s choice of the brand name “bing” is very clever, short and catchy. I can imagine people starting to use the name as a verb, which couldn’t have happened with “Live.com”. I think that an innovative way of presenting search results beyond arranging links based on popularity and relevance is long overdue. During the past years we didn’t see much innovation in that area because it was dominated by Google. I am very thrilled to finally see some competition, because nothing can drive innovation like competition. Comments on this post: Bing VS. Google – A Spark of Search Engine Wars?